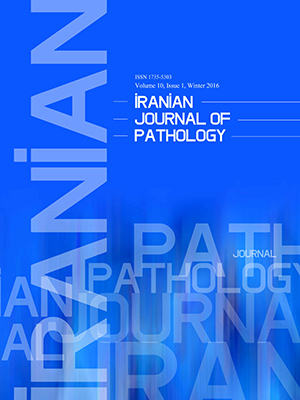 Background & Objective: This study was designed for the first time for the detection of mutant BRAF V600E and its correlation with clinicophathologic features in a sample of Iranian patients with pathologically proved pigmented skin neoplasms. Methods: 82 paraffin-embedded blocks, including melanocytic nevi, malignant melanoma, Basel cell carcinoma, and squamous cell carcinoma were evaluated for BRAF V600E expression by immunohistochemistry in the patients admitted to Ibn Sina Hospital, in the city of Sari, Mazandaran province, North of Iran. The evaluation of immunohistochemical staining was performed by two of the authoring pathologists, and staining intensity was graded from negative (0), weak (1+), moderate (2+) to strong (3+). If twenty percent (or greater) of the tumor cells showed modest to strong cytoplasmic immunoreactivity (score 3+), the neoplasm was considered positive for this tumor marker. Results: Among 82 studied patients, 12 cases (60%) of the malignant melanoma group revealed a high intensity of immunostaining for BRAF V600E, while a significant expression of this marker did not occur in the other investigated skin neoplasm. A great relation between BRAF (V600E) expression and the histologic type of skin cancer was noted. No significant relationship with other parameters such as gender, age, and the grade differentiation of the non-melanoma skin cancer was found. BRAF V600E was weakly correlated with the Clark level of cutaneous malignant melanoma. Conclusion: This data provided further evidence for the strong role of the BRAF V600E mutation in the development of cutaneous malignant melanoma, compared to non-melanoma skin cancers in the North of Iran. We advised future studies to evaluate the beneficial effects of anti-BRAF V600E target therapy on the Iranian melanoma patient who harbors this marker by way of immunostaining tumor tissue.